GONE WILD! is a burlesque nature documentary play that follows Quincy Von Poodle, a zoologist named Randall, and an evil tap dancing dolphin around the world. They travel through jungles, grasslands, and regional airports as they seek to capture a new species of shape shifting creatures! Meanwhile, an insurgent butterfly is preparing for a revolution that may change the world...or at least Rollingsford, New Hampshire! 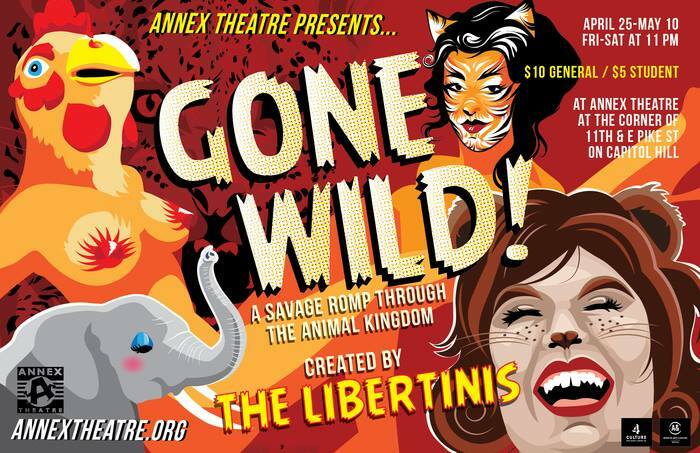 ​If David Attenborough, Bettie Page, and The Muppets all mated and spawned a production it would a lot like GONE WILD! GONE WILD! was originally created and concievced by Seattle’s sexiest interdisciplinary arts ensemble, The Libertinis ( Hattie Hellkat, Tootsie Spangles, Miz Melancholy, Woody Shticks) and written in collaboration with Max Kirchner. The show also features local burlesque artists and actors Marcus Gorman, Maxie Milieu, Sailor St. Claire, Jacquelyn Miedema, Jordan Melin, Dayo Anderson, and Razzberry Rocket. Stage Managed by Cynthia Kelly with lighting designed by Emily Leong.